TSirDiesalot wrote: Because he has over thousand swords. I mean come on, what say's you're not cool if you have over thousand swords. Over a thousand doesn't necessarily mean over nine thousand. Why is Archer so GAR? He is essentially the embodiment of the concept that a human being can gain powers rivaling gods and demons through pure effort. Among the servants, he is the one that is closest to a human being. A nameless hero with no legends written after him nor monuments built to honour him. Yet he confronted heroes from the age of gods without flinching. On top of it all, a lone swordsman with the power to corrode the world and rewrite reality? Poetic. All was forgiven about his behavior after reading Answer at the end of UBW. There were lots of good things, but that's the part I like the most. Saber's royalty and was trained from birth and even born with "the essence of the dragon". Lancer, Gilgamesh, Rider and Berzerker are divine to some extent or another; perfection comes easily to them, even if they pass wind it'll be EPIC wind and others will marvel. Medea's also royalty and gets ancient secrets passed down through her family. Emiya's power came to him through insight, it could have happened to anyone who managed to survive the flames; others did as well although they were less lucky. He was in the right place at the right time, but he was still mortal. The only one that comes close is Assassin; he is ALSO awesome. Can Archer be GAR only just because he looks so GAR? Wouldnt that suffice as GAR? All hail to his garness! Everything has been said about him . Human who goes beyond his mortal limits. Terrific. P.S: i don't see why Shiki or Nanaya would be gar. They have their cool attitude but this is something else so i must disagree. Something similar to Assassin in fact. I think I already stated why Tohno Shiki can't be GAR, but how Nanaya Shiki can on the previous page. As for Assassin, which one do you mean. Is it Caster's Assassin, or True Assassin? Rikh wrote: Also gilgamesh displays no penalty for his strength. Archers UBW and tracing/etc causes him pain and harms his body each time. A hero who "Withstands pain to create many weapons" is indeed pretty gar. Does it harm his body each time? I know it does when Shirou does it, but Archer never seemed to have as much of a problem with it. I mean yeah, eventually he'd reach his limit, and it would, but I got the impression that he'd pretty much mastered the technique, so it's not really very difficult for him, even when doing more difficult projections, or UBW. Not that he didn't withstand pain early on, Rin says a few times that Shirou could easily have died many times over during his early practicing to get to that point. Umm it was discussed before. Performing any art of magecraft causes pain to the user. The simple activation of magic circuits causes the magus pain, since the body becomes a filter for magical energy and transfer it to spells or techniques. I watched the anime first. I didn't think much of Archer until I saw the Archer vs. Berserker fight. After watching that fight, I started becoming an Archer fan. I loved the way he threw everything he had to fight a godly overpowered behemoth. He was truly the underdog and his fight reflected this trait. Then I started playing the game. It only deepened my respect and fondness for him. Archer constantly pushed and pushed his limits to achieve his goals, but sadly, he had to sacrifice his happiness and his future. His abilities are also the coolest because it relies on experience rather than super powers that others receive from birth. I also admire his determination. He knows what he wants and will do what it takes to get it. Although, I don't like how he is willing to hurt the people close to him to reach his goals. Since his past was very dramatic, there is more weight to his goal. It is easier to believe that Archer has more on the line in this war than any other servant. His sarcastic attitude also makes him pretty cool and it hides his traumatic past pretty well. Plus, he is hella hella buff. Not to the point where his body is layered with muscle upon muscle but to the point where he is finely toned. His body matches the strength that he produces (unlike Square Enix characters). Even though I admire Archer, I respect Shirou more than I respect Archer. Shirou also knows what he wants, but his dreams are not shattered because of his naivety. Shirou is constantly going through pain to reach that feathery, good hearted goal. Some could say that Archer went through the same experiences, but the key word is "went". I am judging Shirou and Archer at the time of the 5th holy grail war. Archer has already mastered his abilities and goes through seemingly little trouble to use them, while Shirou is constantly going through a great deal of pain just to use his abilities. Since Archer already went through the pain, I think he suffered less than Shirou during the 5th war. I believe that the present holds more weight than the past. 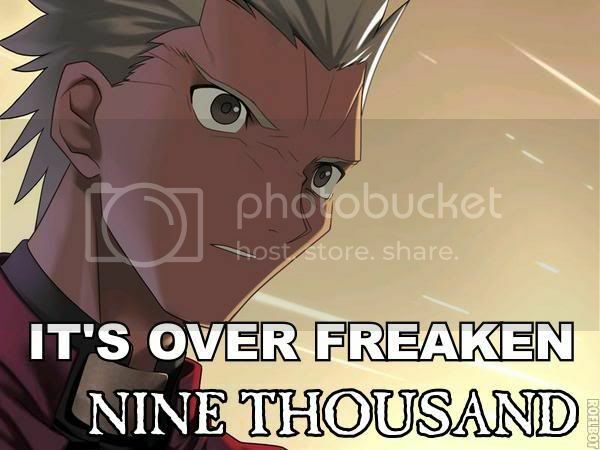 The moment Shirou found out his future in UBW, I believe Shirou and Archer became two completely different people. Archer wallows in his own self pity while Shirou looks for the brighter future. For that reason, I like Shirou more than Archer when it comes towards ideals. So my conclusion is that Archer is unbelievably cool when it comes to his fighting skills, his attitude, his body and his role as the underdog. But when it comes to ideals, I admire Shirou more than Archer. However, since I am placing Shirou on a pedestal, it raises Archer GARness as well. Plus, he has a song dedicated to him. That is pretty awesome. TheRedArcher wrote: Plus, he has a song dedicated to him. That is pretty awesome. So does Gilgamesh, and Saber. Gilgamesh's song had a nice few seconds into it, then it nosedived. Saber's song is only good during the middle-end. Oh man, what I would do for everyday school. What, you mean the character image songs? So do Shirou, Sakura, Caster, Ilya, Taiga+Ilya, and Rin. Edit: Oh, you probably meant UBW. Last edited by nobaka on February 23rd, 2009, 4:39 am, edited 1 time in total. SmellyGoomba wrote: Gilgamesh's song had a nice few seconds into it, then it nosedived. the songs in the soundtrack. I can't remember the name of Saber's song, but its the one that plays when she draws the sword out of the stone. TheRedArcher wrote: I watched the anime first. I didn't think much of Archer until I saw the Archer vs. Berserker fight. After watching that fight, I started becoming an Archer fan. I loved the way he threw everything he had to fight a godly overpowered behemoth. He was truly the underdog and his fight reflected this trait. I also have another question. Did the term "GAR" originate from Archer? Yes. Someone was trying to say they were GAY for ARCHER on 4chan and messed up. Thus GAR was born. that one guy wrote: Yes. Someone was trying to say they were GAY for ARCHER on 4chan and messed up. Thus GAR was born. Message wrote: I sort of agree with you - Archer isn't as gar as people make him out to be. But if you remove his shortcomings/obsessions, he can act pretty darn cool if he wants to.